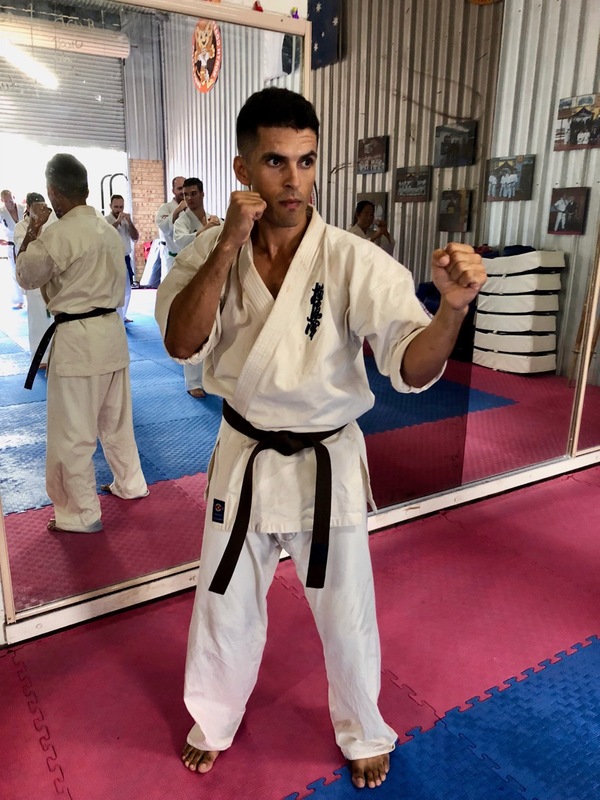 For Kyokushin International Martial Arts Australia, 2018 was a year of consolidating knowledge, pursuing higher technical ability and pushing new goals in tournaments. Three major seminars were held. 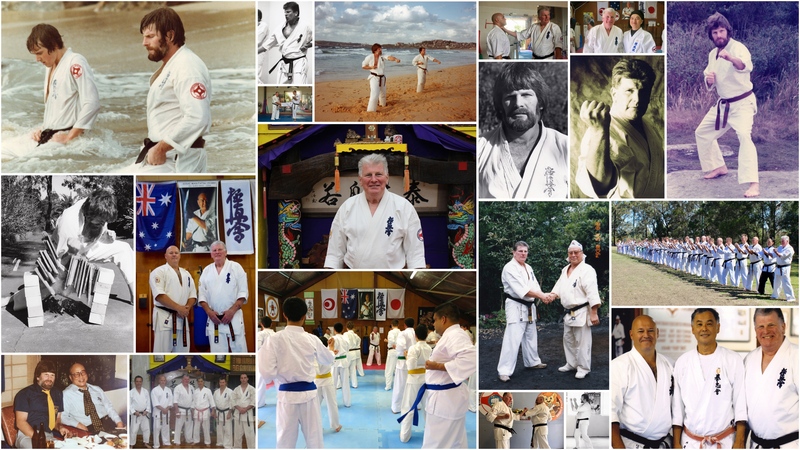 The first took place in Sydney, at Shihan Rick Cunningham’s Annangrove Dojo. The seminar focused on all things Kyokushin – kihon (basics), kata (forms), kumite (sparring) and tameshiwari (board breaking). The seminar had students from all the New South Wales dojos in attendance. Some standout board breaking performances in the video below include Sensei Ben Ng, Sempai Jason Lambe, Sempai Joshua Darley and Sempai Angus Sweeney. Training continued at a relentless pace in the lead-up to junior and senior gradings in May and June. In May, Hanshi Howard Lipman taught at the KIMAA North Coast Seminar, hosted at both Sensei Mark McFadden’s Lismore Dojo and Sensei Jon Ellis’s Ballina Dojo. Sensei Rob James and students of his Brisbane Dojo also participated. This was Hanshi’s second North Coast trip in as many years. The junior grades and those unable to make the Sydney trips thoroughly enjoyed the experience of being taught by the head of KIMAA. The seminar ended with a junior grading, where Hanshi assessed the students. 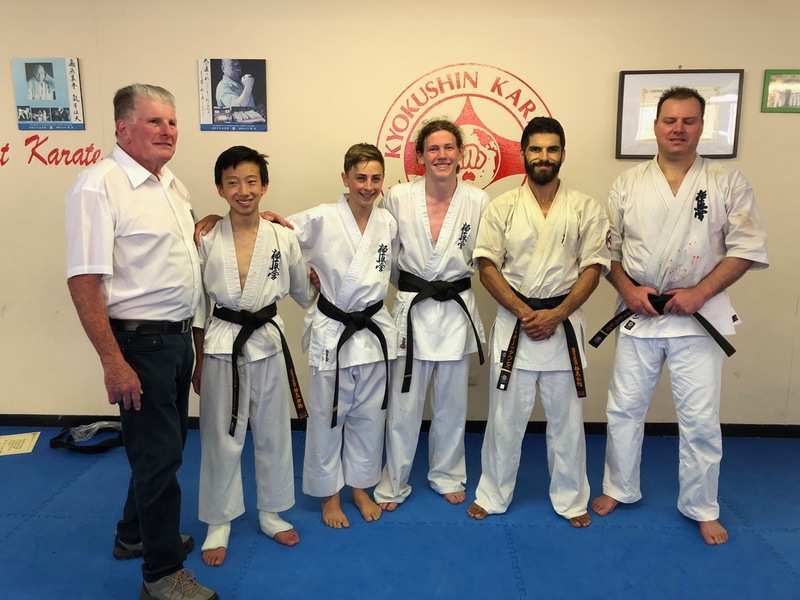 The senior Kyokushin grading in June brought members from KIMAA back together. Karateka from Turramurra, Annangrove, Lismore and Young dojos were all assessed by Hanshi. 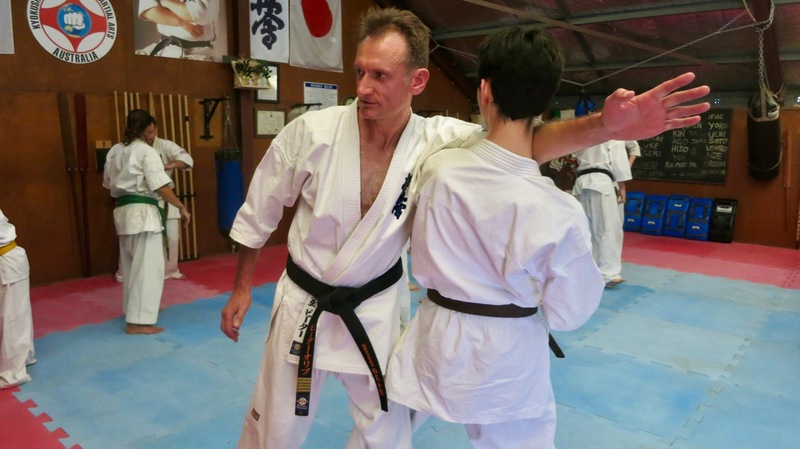 Sean Stevens had the honour – and the pressure – of being the first student from Young Dojo, having become part of KIMAA last year, to be assessed at a KIMAA senior grading. Despite some nerves, Sean took on the challenge. Wesley Snider of Lismore, despite suffering bronchitis, stepped up and achieved the rank of 1st Kyu. 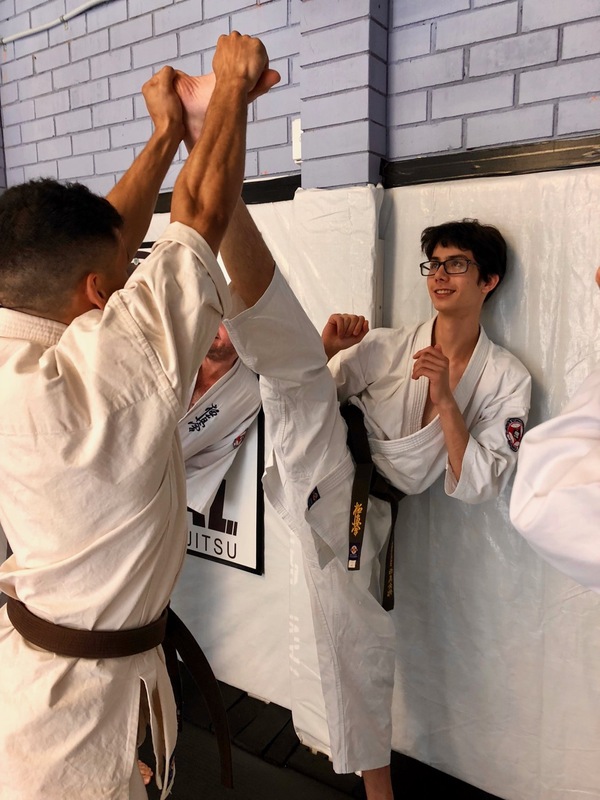 And two students from Turramurra received new black belt grades: Jasper Choi fought through the 40 fights for Shodan (1st Dan), becoming a Sempai; and Alex Lloyd reached the rank of Sandan (3rd Dan), becoming a Sensei. Sempai Jasper and Sensei Alex also wrote essays for their gradings, published on the KIMAA website: ‘Growing Up With the Martial Arts’ and ‘The Role of Teaching in the Development of a Martial Artist’. In between the major calendar events, each dojo continued the hard work. 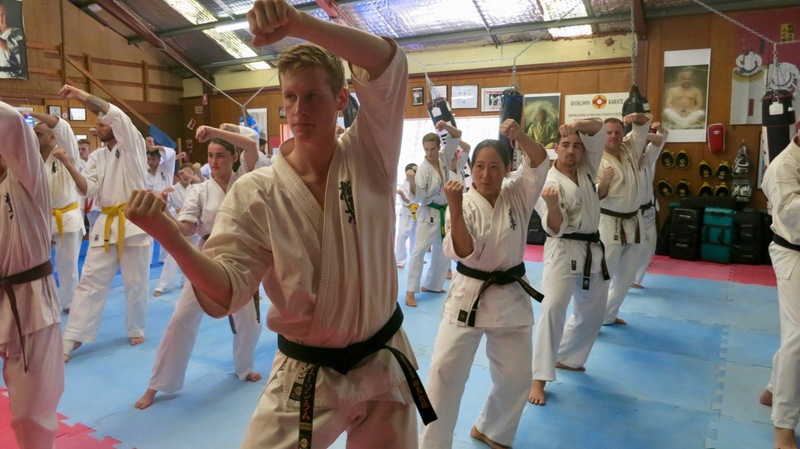 The Sydney KIMAA yudansha (black belt grades) came together when they could to train. Two dedicated classes were held at Turramurra Dojo in February and August. 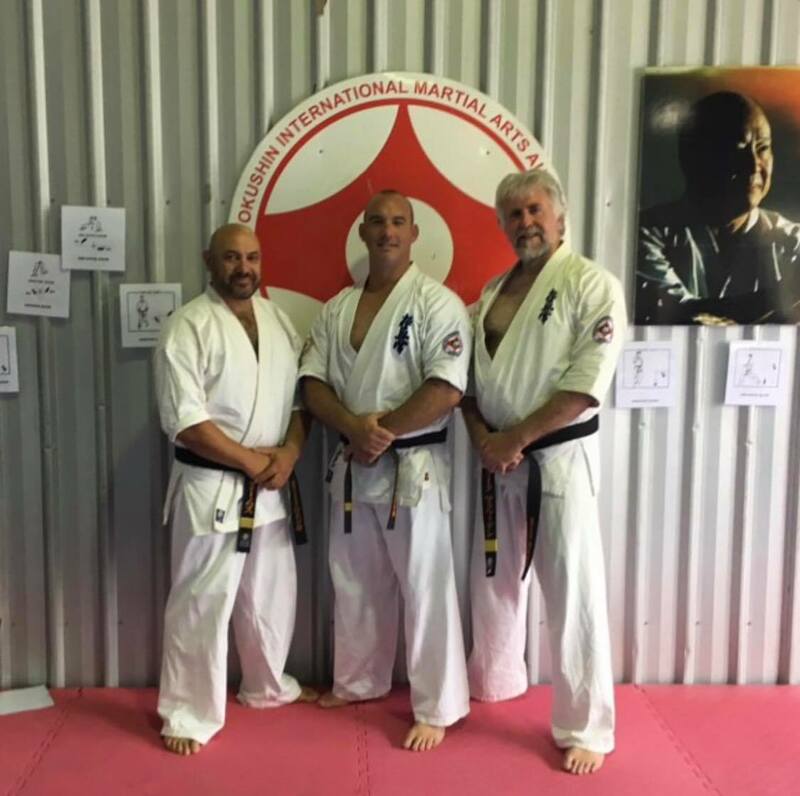 At Turramurra, Hanshi Howard pushed his senior grades to take up the mantle of teaching on more occasions, with the General classes rotating between the instruction of Hanshi, Shihan Peter Olive, Shihan Idir Bahamid, Sensei Mark Shelmerdine, Sensei James Sidwell, Sensei Ben and Sensei Alex. 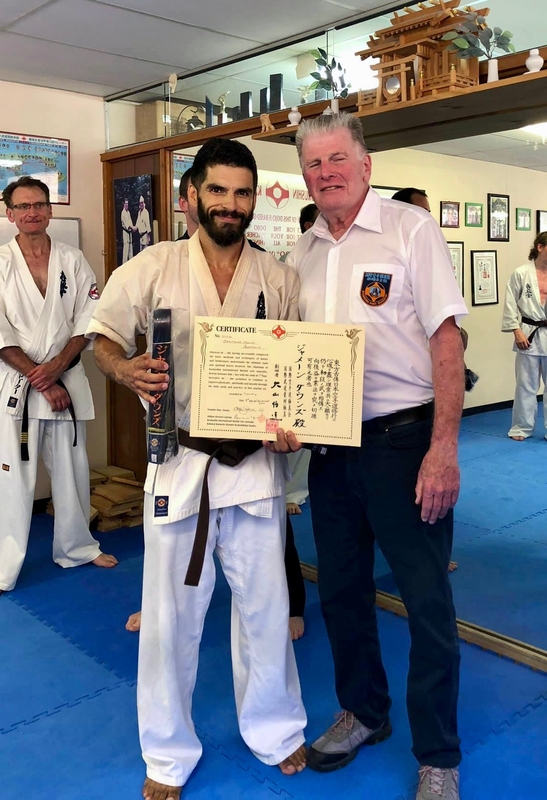 Sempai Jasper, in the lead up to his grading and in the months following, became an integral part of the Kids classes, either as instructor or in assistance to Hanshi Howard and Sensei James – despite undergoing his Year 12 Higher School Certificate. 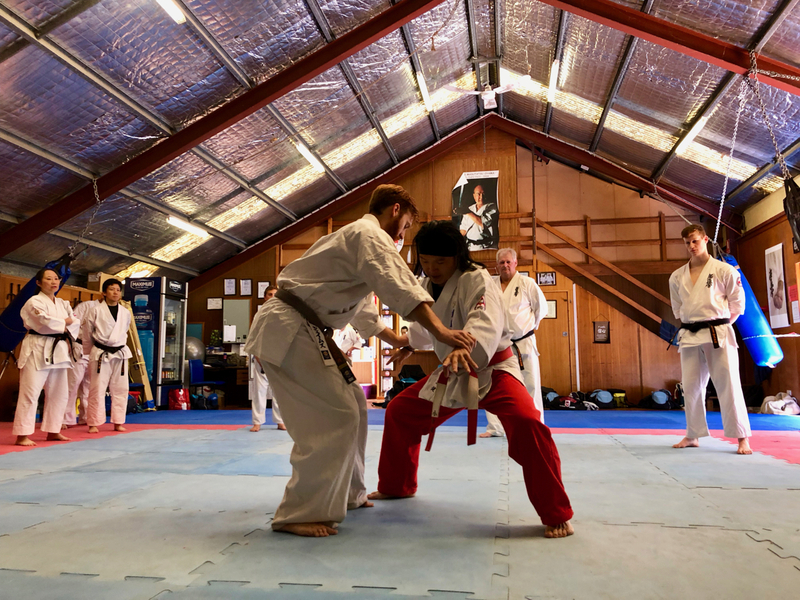 Annangrove Dojo, meanwhile, saw an expansion of its timetable, with Sempai Jason beginning Saturday morning classes, providing more opportunities for Annangrove students to train. This is an excellent step for a young Nidan (2nd Dan) who, under the tutelage of Shihan Rick, Shihan Peter, Sensei Paul Finnerty and Sensei Ian Holdaway, is beginning to walk the long path of teaching. Similar efforts were replicated at Sensei Rob James’s Brisbane Dojo, with Sensei Rob’s senior student, then-1st kyu Jermaine Downs, being a significant support in the adults and Little Lions classes. Sensei Rob also chose to embrace the reputation of the ‘Sunshine State’, regularly taking his students to outdoor training sessions. By exposing his students to different environments, it takes them out of their comfort zones and increases awareness in training. Another significant initiative undertaken by Sensei Rob was the commencement of martial arts classes specifically tailored for children on the autism spectrum. 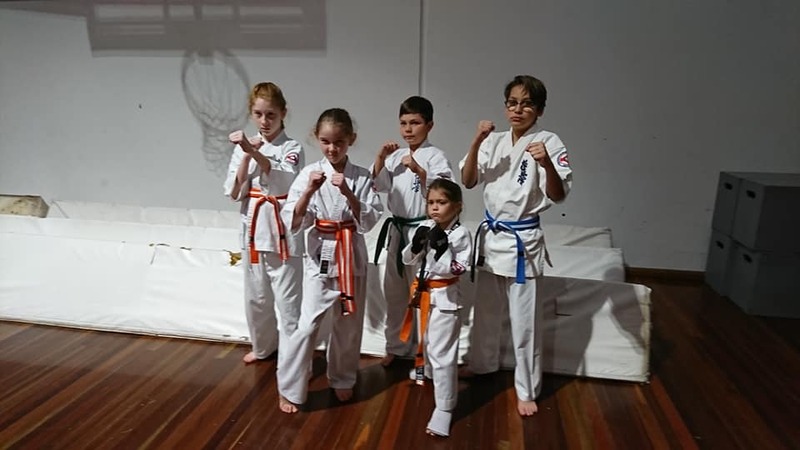 These were conducted at the Pine Rivers PCYC and will resume in January 2019 – interested parties should contact Sensei Rob at his number listed on this page. KIMAA North Coast Little Lions at the NAS. Between their own seminar and travelling to Sydney for seminars and gradings, the North Coast calendar was already full. But that was hardly an obstacle for these karateka. Students of Lismore are regular competitors at the National All Styles tournaments, which continued through 2018. Under the tutelage of Sensei Mark McFadden, Sempai Wally Gray and Sempai Patricia Tan, many Little Lions gave it a crack both on the sparring mats and in kata demonstrations. 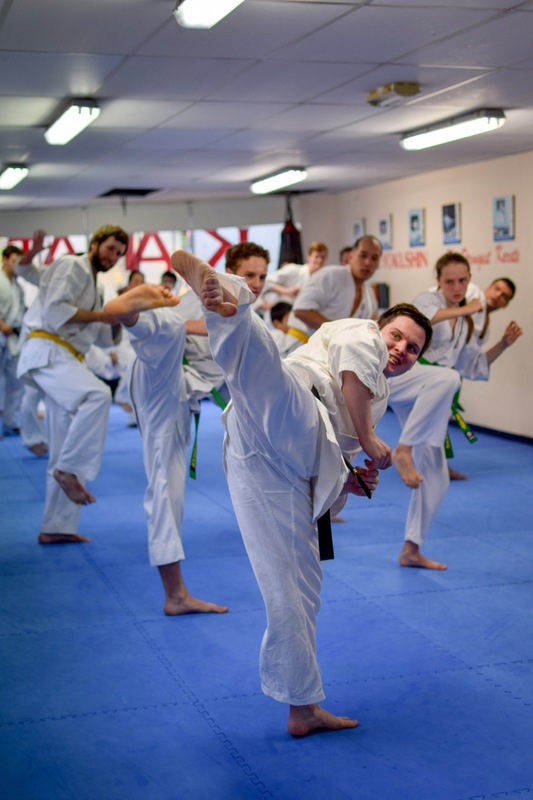 Ballina Dojo had an exciting relocation – and space upgrade. The new dojo opened in August, with Sensei Jon Ellis receiving great assistance from his loyal brown belts and ‘dojo sergeant major’ Larissa Watson. Following the 2017 introduction of Naihanchi kata into the KIMAA syllabus, honing this kata was a focal point of training throughout the year for all KIMAA students, under Shihan Idir’s supervision. Sensei Mark Shelmerdine runs through the Bo with students at the Shihan Ken Seminar. The study of Okinawan Kobudo continued in 2018 across KIMAA. In Brisbane, Sensei Rob ran Kobudo study groups during the year, focusing primarily on the Bo staff. Sensei Dave and others at Young Dojo gained further exposure to Kobudo during Sydney seminars. The North Coast and Sydney Kobudo classes ran regularly, with chief instructors being Sensei Mark McFadden and Sensei Jon Ellis, and Shihan Rick Cunningham and Sensei Mark Shelmerdine respectively. The North Coast junior Kobudo students continued to expand their kata repertoire, while the seniors particularly focused on the new Eku kata taught at the 2017 Shihan Ken Seminar. In August, Hanshi Howard Lipman graded Sensei Alex Lloyd to 3rd Dan and Sensei James Sidwell to 2nd Dan in Kobudo, which was certified by Sensei Hokama. Shihan Ken Ogura demonstrates bunkai with Sempai James Campbell. The penultimate calendar event that brought the dojos together was the 2018 Shihan Ken Seminar. 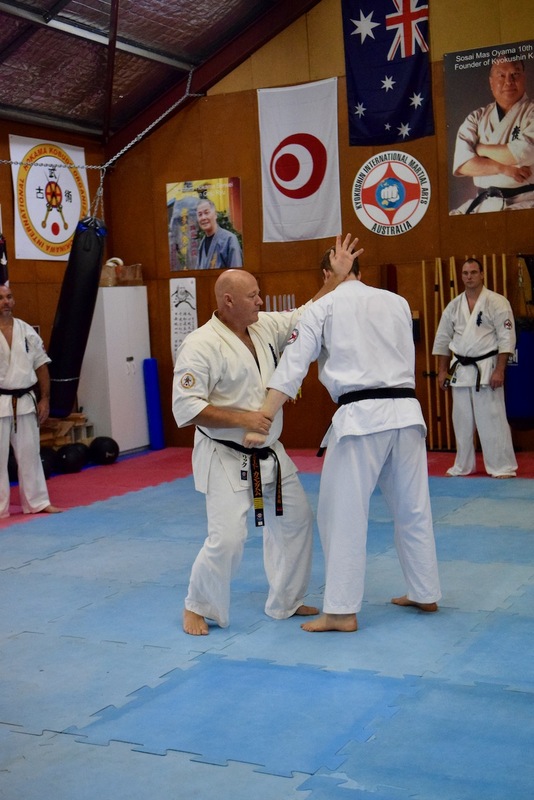 This was the third Australian seminar featuring Shihan Ken Ogura as the guest instructor, following the 2016 and 2017 seminars, and the 2015 and 2017 Japan trips. 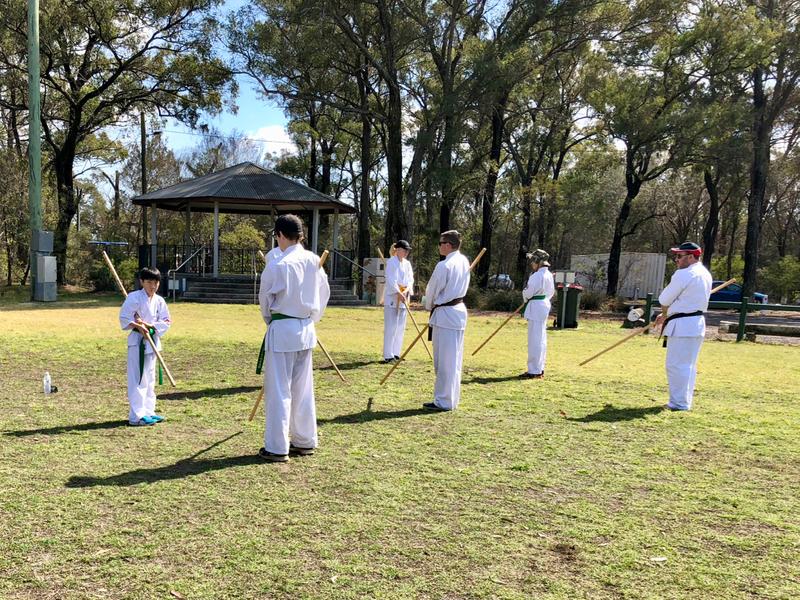 Over the course of the week, Shihan Ken exhaustively went through kata, bunkai (self-defence applications) and Kobudo with karateka of all grade levels from the New South Wales dojos, and some guests from other organisations. The seminar was a highlight of the year, and exemplifies the ongoing relationships between KIMAA and Japan. 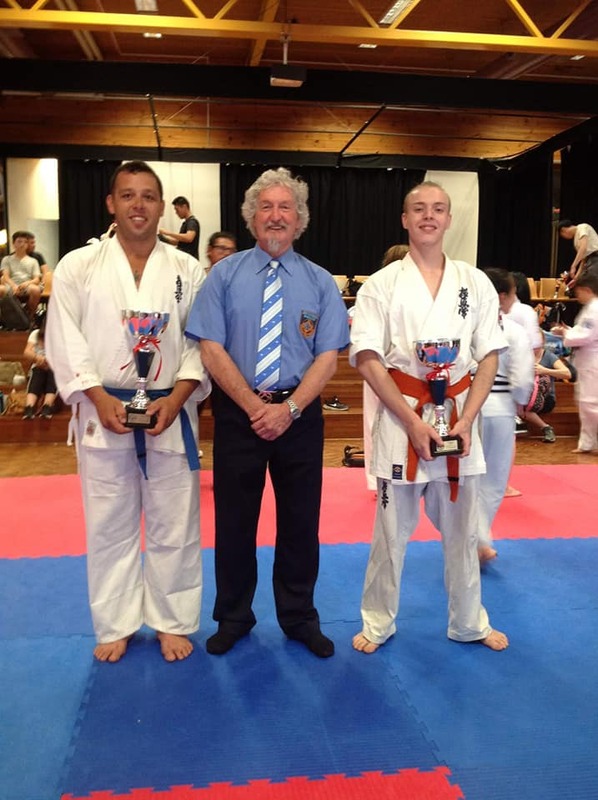 Sensei David Craigie with Josh and Damon at the KIKO Tournament. Throughout the course of the year, Sensei David Craigie at Young Dojo had his students hard at work on their kumite, with an eye to competing in tournaments. Josh Galea and Damon Townsend competed in a local Griffith tournament in September, both placing First in their respective divisions. Josh powered through his opponents, while Damon executed a brilliant knock-out kick. They followed this up in November, at the KIKO National Tournament held in Sydney by Kancho Doug Turnbull. Josh and Damon again took First places, returning to Young with a delighted Sensei and the news that they were national champions. Sempai Jermaine Downs and Hanshi Howard Lipman after the grading. The second senior Kyokushin grading was the final calendar event to bring the KIMAA dojos together. It was held at Turramurra in December. 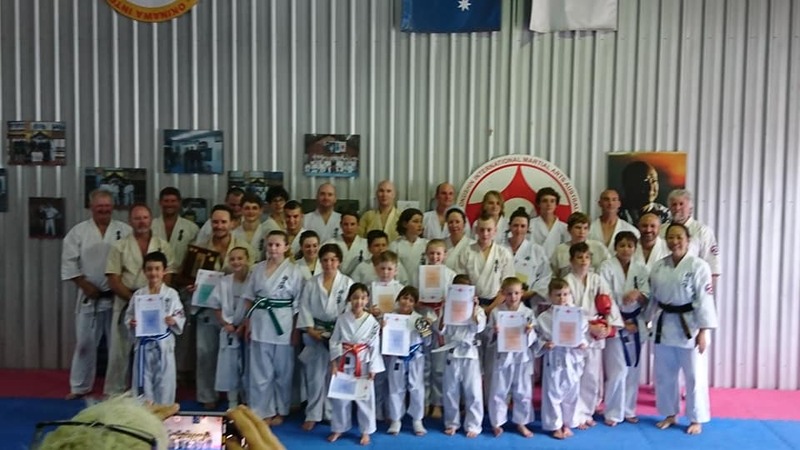 Students from Sydney, Brisbane and the North Coast participated in the grading, conducted by Shihan Peter, Shihan Idir and assessed by Hanshi Howard. All students performed admirably, including the new black belt grades: Sempai Josh Darley (Nidan), Sempai Stephen Runge (Shodan), Sempai Jermaine Downs (Shodan), Sempai Bernard Wilson (Shodan) and Sempai Cody Choi (Shodan). This grading notably resulted in the first Black Belt produced by Sensei Rob and Brisbane Dojo – Sempai Jermaine. You can read Hanshi Howard’s report on the 2018 Yudansha gradings here, on Facebook. The North Coast end-of-year session. Following the grading in Sydney, the North Coast crew conducted their usual end-of-year Kyokushin training and grading session, celebrating at the end with Student of the Year awards. KIMAA’s year was made up by its dedicated students continuing to push hard at their martial arts – whether it was for a tournament, a grading or simply their own self-development. Thank you as always to the dojo operators and instructors for keeping things running smoothly. The best way to summarise the year, the milestones reached and the fun that was had, is with the latest KIMAA video below. Have a wonderful holiday season all, and see you in 2019. Karateka of the North Coast dojos Lismore and Ballina came together for their annual end-of-year training and grading session. Weather prevented the typical beach session, so Sensei Mark McFadden hosted all comers at his dojo in Lismore. Also in attendance was Sensei Jon Ellis and his students, and Sensei Rob James from Brisbane Dojo. After the training session and grading, Student of the Year awards were presented. Holly was the Lismore Student of the Year, and Akayla the Lismore Little Lion of the Year. Blayne was the Ballina Student of the Year, and Cooper the Ballina Little Lion of the Year. Congratulations to the students who received special awards and to all those who graded.